Although snorkels look cool, they're far from the only step that you should take when modifying your 4x4 for deep water crossings. Lets start a discussion on things to do to ensure your rig is ready for the deep stuff. The first thing to consider is that water is really harsh on the vehicle. If you encounter deep water frequently, expect increased maintenence to keep it up to snuff, including repacking wheel bearings, and changing diff fluids with more frequency, keeping an eye on t-case, and transmission fluids for sign of water intrusion. The first mods, should be to up the breather tubes on both axles, your transmission and transfer case as high as possible. If your vehicle has a snorkel (second thing to do), it makes sense to run them up to the top of the snorkel. I've done many deep water crossings and haven't had any trouble. Not sure I should jinx myself but thought I'd share. I do have the rear diff vent extended quite a distance above my waterline. I do not have the front done but have that slated for coming soon. On both the Frontier and Xterra, there is only one component that will ruin our day. Nissan laid out everything quite nicely except the Alternator. It's located at the bottom of the engine and is fairly succeptable to dirty water. Clean does nothing to it but dirty will kill it quickly. I speak from experience - already killed one and I think my present one might be failing soon. My door seals are fair. Already had water intrusion once. Two days after I bought the truck and stalled in in four feet of water. What can I say? I was a rookie. The other item which is probably more universal is the ECU. On Xterra's and Frontiers it's located just forward of the center consol. Flood one of our vehicles and it can be toast really quick. A possible solution has been to custom cut a plastic container (tupperware or other), seal the unit inside and caulk any openings to make it watertight. Another concern that was mentioned in water hazards, the water itself getting so deep that it makes contact with the engine powered fan. Broken blades are just one problem. An alternate is going electric but there are arguements against them as well. What about Dielecric Grease (sp?) and where to put it. I have heard that it can really help to waterproof some electical areas. So what would be the best electical parts or area to waterproof? If we get a fair bit of info on this thread, I'll try to consolidate in the first couple of posts. As to dialectric grease, I put it around the seals of my distributor and both ends of my spark plug wires, although the spark plug end seems to be a tight enough fit that its probably overkill. A good modification to consider is electric fans. That way, you have the ability to turn the fans off for deep water crossings. That seems to be a big killer with petrol engines, is the fan kicking water up into the rest of the engine compartment shorting out the system. Of course, never underestimate the power of WD-40 and a couple of paper towels, to dry stuff out after a really deep crossing. I had one crossing a couple of years ago where the water was about 3-4" up the windshield (kind of freaky, because the truck started to float at that point). At the end of the rather long water crossing the truck sputtered a bit and was running rough. A generous amount of WD-40 and a couple of paper towels later, and it was running like new. 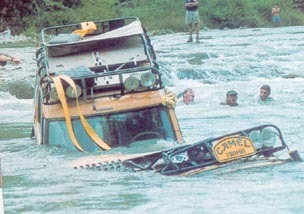 One concern I have with deep water crossings is premature airbag deployment, if the vehicle is so equipped. I'm not sure what needs to get wet for this to occur, but I've known it to happen to Jeep Cherokees, and it has probably happened to other makes and models as well. I've been in the drink over door sills but below the headlights and haven't had a problem, so I imagine it takes alot of water - probably prolonged submersion, but I don't know how much and where. EDIT: On 1997 or 1998 Jeep Cherokee, the air bag sensor box was located under the driver side seat. Apparently, water welling up under the seat would cause the air bag to fail or deploy. These models were recalled and the box was relocated to under the center console on top of the tunnel. In any case, it is clear that this is a factor that should be taken into consideration when waterproofing, depending on the vehicle. this is a good thread Pangaea. Keep it comin' ya'll. I've always worried about my intake..that being said I've always wanted a snorkel (I will and always have worried about enough caulk to make the intake waterproof after adding a snorkel) However I know one day when I'm either careless or the water is deeper than anticipated, I will reach a point of getting electrical things wet. Thats where I lack knowledge. I know I have an electrical box under or near my glove box...this needs to be waterproofed. I think I am confused on exactly how to waterproof the distributor. I can handle the spark plug wires. I need to get an electric fan..I found some from Nullifier. Take a rubber glove and cut the tips off all five fingers. Route the coil wire through the middle finger and two wires through each left over finger (assuming a V8). Zip tie the base of the glove to below the bottom of the cap, and use smaller zip ties around the ends of each finger tip. Plug any holes or gaps with silicone, and you've got a pretty decent waterproffing solution for the ignition. send me a deisel from Africa and we'll call it done. Damn, where'd I put that oil tanker? Let me get in a call to off shore Angola and we'll see what we can do! I'm a p%$$ about running thru deep water. If it's more than 3' deep I'm looking for a better route. If its more than 4' I would prolly turn around. 3' is a little over my tires and at 4' it's just below the hood. All my breathers and stuff are good for a 3' crossing but more than that...??? tea toto, thats some deep water, prepared or not. I'm not really afraid of deep water if I'm ready for it but more scared of Moving water.